The three other chapters in this series focused on Prague’s main tourist attractions at or near the Vltava River — the Prague Castle, the Charles Bridge, etc. Those with only a day or so would certainly want to concentrate there. However, with a full weekend or longer to spend, allowed me the chance to venture further away in order to get in some shopping and just to get away from the other tourists. The place I started was the “New City”, or Nové Město District. Nové Město surrounded the Staré Město to the east and south and extended southward along the Vltava’s east bank to the main railroad bridge. 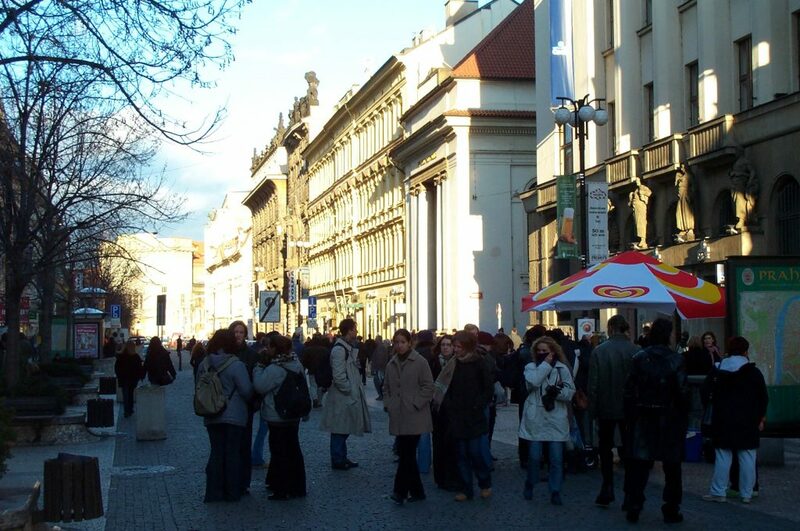 Geographically, it was one of Prague’s larger districts. Culturally, it was varied. The parts closer to the Old City were busy commercial districts, the southern end was dominated by federal buildings, and hotels and residences filled most of the ground in between. Clearly, the best parts were the commercial districts to the north. Nové Město had almost as much of a pedestrian zone as the Staré Město, in fact. My tour of the district began at the Námestí Republiky, the Republic Square, where the two Districts met. The Obecni Dům, shown in the first photo, resided right next to the Prašná Brána (Powder Tower, see Staré Město) and was one of the best decorated buildings in all of Prague, and that was saying something. It was a combination theater and shopping center, the ritziest shopping center in the city. Like many buildings in Prague, it looked like it just got renovated, and the colors of the mural in front looked bright as new. From the Obecni Dům, I learned that the best direction to head was along the street named Na Přikopé, shown in the second photo. This street was the transition from the tourist parts of the city to the ‘regular’ commercial district, dominated by common European brand-name department stores and fast food, but with plenty of indigenous options as well. Much of that street was also recently renovated, with bright, beautiful storefronts and freshly laid cobblestone that one could easily rollerblade on. The commercial district was several blocks long and wide, with a number of small marketsquares and hidden passages, but few significant landmarks. The streets twisted and turned quite a bit, which got me lost on occasion, but with the help of one huge landmark, I was always able to get back on track. 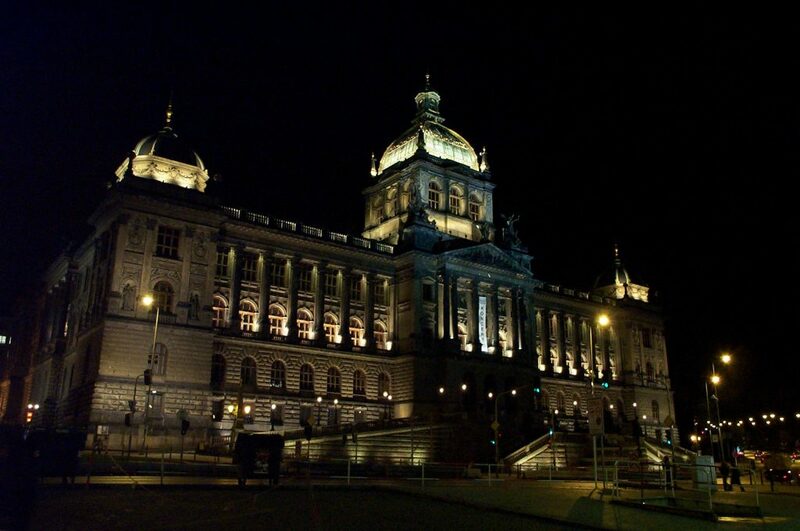 That was the Národní Muzeum, or National Museum, shown at night in the third photo. The Museum sat on a high hill overlooking a long wide boulevard (the Václavské Námestí), an easy place to find. I sadly did not have time to visit the Museum — that is on my to-do list for my next visit to Prague. The north-south road that the Museum sat on was the city’s main highway, and that highway also passed in front of the main train station to the north (the Hlavní Nádrazí). 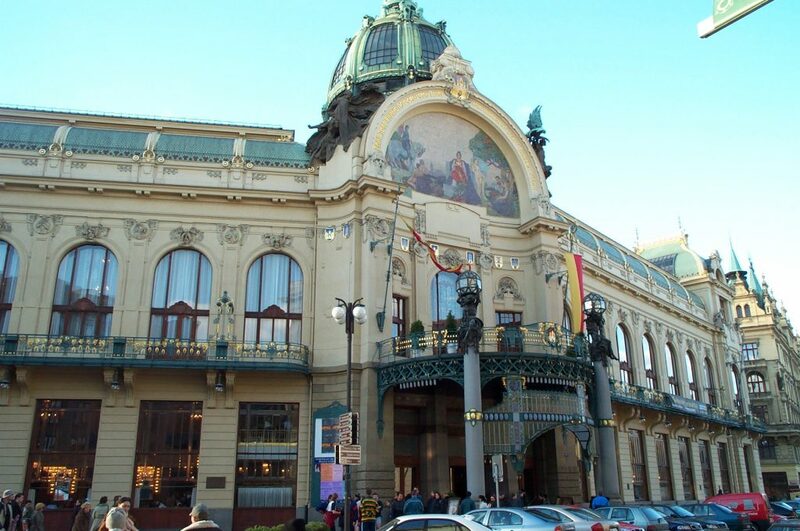 I mentioned the train station here because taking the train into and around Prague can be an adventure. The Hlavní Nádrazí was one of a dozen train stations in Prague, but the train network was not terribly efficient. While one could easily travel long-distance and international routes from the main station, many of the routes to other Czech cities were only accessible from the minor stations. I offer this word of caution that visitors should check their itinerary when traveling to Prague and verify the particular train station(s). Or, specify the Hlavní Nádrazí as the originating or destination station when purchasing a ticket. The further south I went, the less engaging the Nové Město became, but there were sufficient points of interest that I did not immediately turn around. As an example, the fourth photo shows two of them — a World War I monument and the Emauzy convent in the background, with its unusually shaped roof (actually a recent addition after war damage). If you look closely at the monument, you will note some unusually white pixels on one of the sculptures. That was a flower wreath, likely there because that visit to Prague occurred over Veterans’ Day weekend. 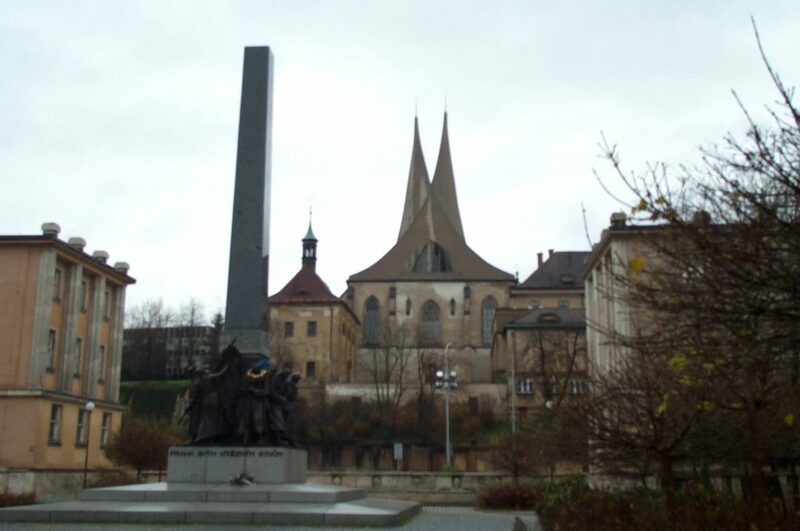 The southern end was loaded with monuments, many of them in the Karlovo Namesti park behind the Emauzy. Also, many of the federal buildings were recently renovated were very quite impressive, and there were several smaller churches amongst the residential buildings. One thing about the residences I noted were the opportunities to see just how much the ongoing renovation work has helped Prague’s appearance. The fifth photograph shows a great example, exhibiting two halves of the same apartment complex. I called shots like these “Before and After” pics in my library, and I have found many similar scenes in other former Warsaw Pact locations. Considering how large Prague was, I gained a great appreciation for the extensive work required to clean the city up as much as it has since the Czech Republic regained its independence. 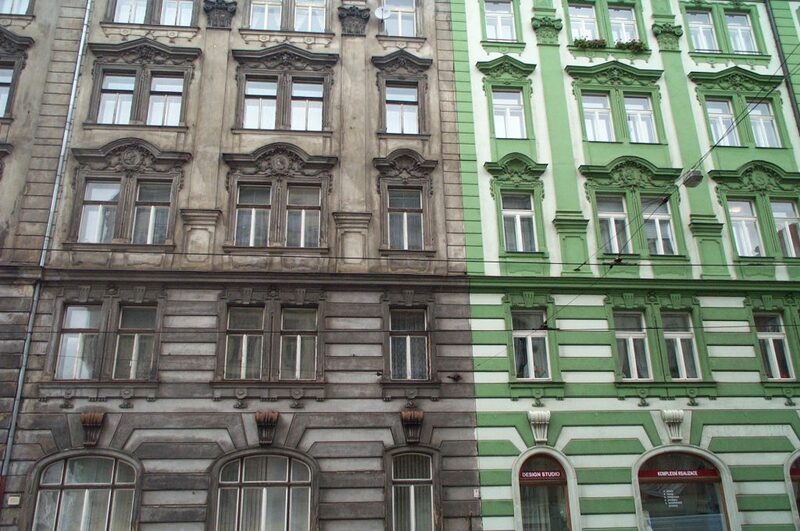 As of my last visit in 2002, Prague still had a lot more residential buildings looking like the gray left side vice the cleaned-up right. As I said up front, Nové Město is a part of town to do if you have time. On the other hand, you ought to find the time, at least to hit the magnificent National Museum and tool around the stores nearby.